Brigade Bricklane is a new residential township being developed by Brigade Groups and is coming up in strategic locales off Kogilu Road, Jakkur of North Bangalore. 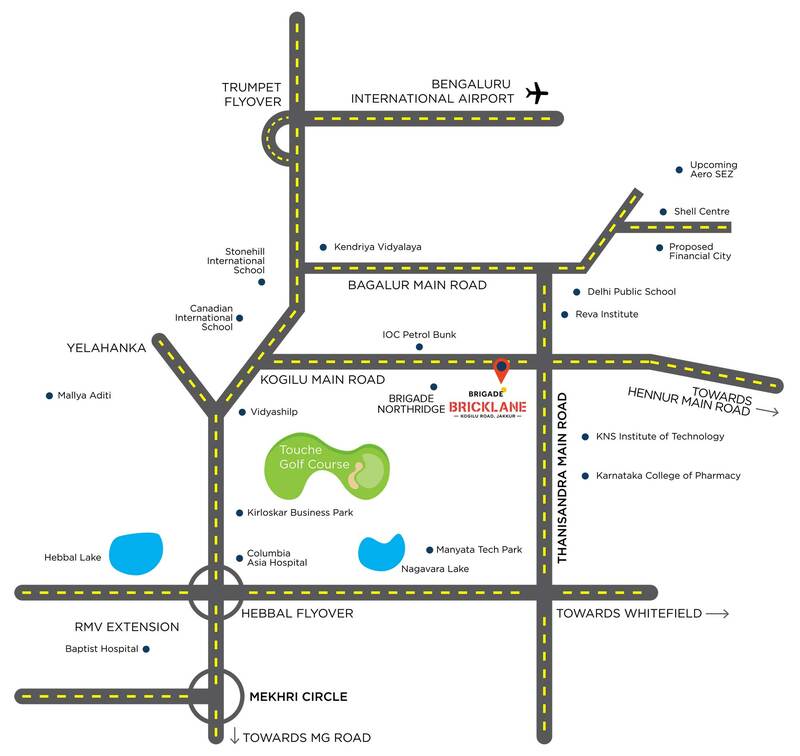 Jakkur is a prime suburb of Northern zone of Bangalore and is home to Jawaharlal Nehru Centre for Advanced and Scientific Research. The area is enriched with lush natural greenery and has the iconic Jakkur Lake. The Baptist Mission Hospital is another major landmark here, along with the Manipal School of Information Technology. The other social infrastructure around Brigade Bricklane includes Delhi Public School (4 Kms from the premise), Canadian International School (7 Kms), Manyata Tech Park (8 Kms), Columbia Asia Hospital (10 Kms) and Kempegowda International Airport (22 Kms). Brigade Bricklane is a smartly outlined residential establishment coming up in Jakkur on Kogilu Main Road of North Bangalore. Jakkur is counted among the most rapidly developing localities of the city with an attractive average annual return of 11%-14%, as per market estimates. Jakkur currently has more than 100 new and upcoming residential projects and has adjacency to prime areas like Hebbal and Kodigehalli. The upcoming physical infrastructure includes the construction of the proposed Peripheral Ring Road, supporting 8 lanes of traffic that is expected to decongest traffic to a great extent in the entire stretch. The proposed elevated expressway will boost connectivity of this area and seamlessly connects Jakkur to Kempegowda International Airport. The current price trends in Jakkur sets the right platform for property purchases here. The area offers ample choices for investors looking to invest in any form of property investments from high-end villas to duplex abodes, from affordable housing to mid-range housing. Jakkur has hugely competitive property rates and offers good scope of future appreciation. The connectivity to major business destinations like Hebbal, the proximity to International Airport at Devanahalli, presence of the Aerodrome and other developing social infrastructure, will continue to facilitate appreciation. The Current property rate varies between Rs 4,077 and 6,047 per square feet with a price appreciation of 1 to 3 percent over the last quarter of 2018.